With the warm weather finally showing us a glimpse of spring, barbecuing comes to my mind. I can’t wait to get my hands on that grill! Cold summer salads are also a favorite for the season, too. Especially healthy ones. 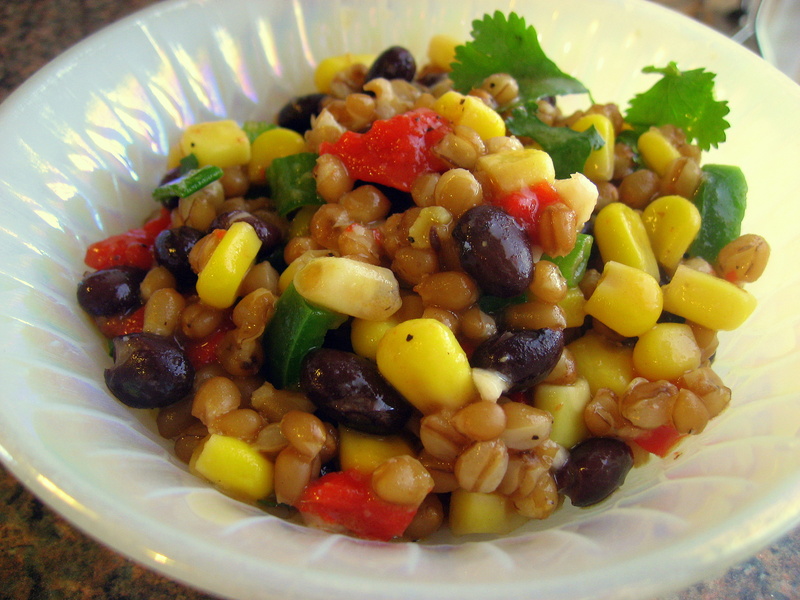 That’s where today’s recipe for black bean, corn, and wheat berry salad comes into play. If you recall, I introduced you to the wheat berry some time last year, giving you a recipe for my perfect protein salad. This is another opportunity for you to experiment with the healthy, full-of-fiber wheat berry. Step one: If you’re using dry black beans, you will need to soak them in cold water for a few hours at room temperature or overnight in the refrigerator. Rinse and drain them well. Then cook until tender (about 1 1/2 hours). Step two: Place wheat berries in a large saucepan and cover with cold water by about 4 inches. Bring to a boil and simmer for 1 to 1 1/2 hours until tender. Drain well. They should be chewy, but still tender — never soft. Step three: Combine with beans. Add corn, peppers, jalapeno, cilantro, basil, mint and chives to salad ( or whichever herbs you’ve chosen to use). Step four: Make the dressing. Whisk together vinegar, pepper, garlic, salt and oil. Toss dressing with salad. If you need to, you can adjust the seasonings to fit your liking. For my salad, I used cilantro and scallions. The original recipe for this salad suggests the addition of arugula or watercress. You can add whatever makes you happy! Enjoy! It’s the dead of winter. Eating comfort foods is right on this time of year. But comfort food doesn’t have to be bad for you if you know how to make healthy alternatives. 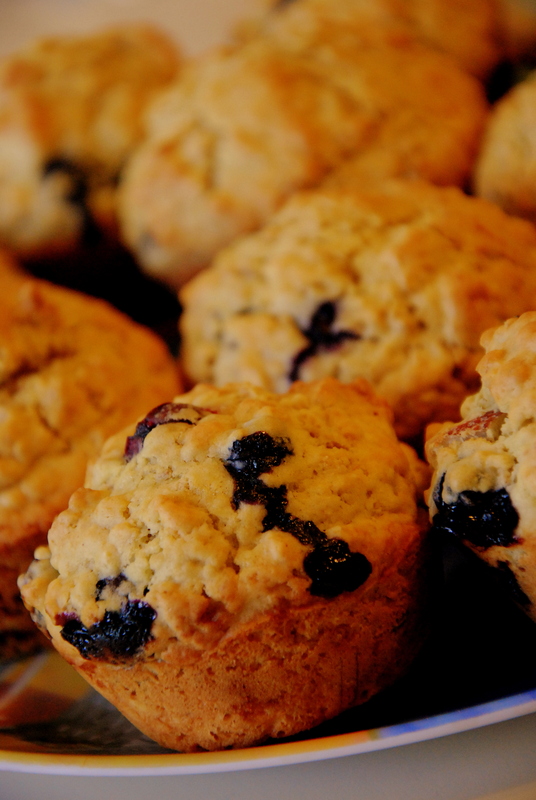 Enter the blueberry almond oat muffin. This little treat makes a delicious snack, on-the-go food, breakfast, dessert, or lunch side. It also pairs very nicely with a hearty winter bean soup. Step 1: Preheat oven to 350 degrees. Spray muffin pan with nonstick cooking spray or line with paper liners. Step 2: Combine flour, oats, brown sugar, baking powder and salt in a large bowl; mix well. Stir in blueberries and lemon zest. Add milk, butter and egg; mix until dry ingredients are moistened. Step 3: Scoop batter into muffin cups. Sprinkle almonds evenly over batter, pressing down gently (or you can dump the almonds right into the batter while you’re mixing all the ingredients together). Bake 18-20 minutes or until golden brown. Remove from oven and cool 5 minutes. *A quick note about blueberries: it’s hard to find great tasting berries this time of year. Most berries have to be shipped in from far away countries, like Chile or Venezuela, so they are often not fresh and loaded with preservatives to keep them from spoiling on the journey. As a result, a tangier taste ensues. Keep this in mind when you cook with berries during the winter. Thanks to the Pampered Chef cookbook for this one. Today, you will enjoy african style peanut butter soup. Step 1: Heat oil in a large saucepan over medium heat. Add onion, pepper, and celery. Saute until vegetables are very tender (about 10 minutes). Step 2: Stir in the garlic and chili powder. Saute for an extra minute longer. Step 4: Stir in the rice and the cooked chicken. Cook five minutes longer. You’re done! This has a very unique flavor to it, but you have to like peanut butter to really enjoy it (of course.) But it’s not an overpowering peanut butter flavor. I had my doubts when I put a whole cup of the stuff into my soup, but it turned out great. After it simmers for a bit, the flavors all come together to create something wonderful. The consistency is very creamy, and all the vegetables, chicken, and rice are deliciously coated with a nice layer of the peanut butter-broth mix. For my next recipe, I want to encourage you to try something a little different — a little healthier, perhaps. With help from Barbara, the master of healthy cooking, I have whipped up a nice, crunchy concoction that all veggie lovers will love. Goodness, look at those wheat berries, veggies, and tofu! Photo by Kate Langenburg. First, let me introduce you to the wheat berry. Say it with me…wheat. berry. Good. That’s where that crunch is going to come from. Wheat berries are the truest whole grains you can find out there. Because their kernels are still together, none of the nutrients have been removed by the time you dig in. Here’s a whole wheat berry fact page. The cool thing about this recipe is that you can follow it very loosely. There are a few staples that you must have, but other than that, the options are limitless. Step 1: Heat wheat berries in 2 1/2 cups water. Bring to a boil and stir once or twice. Cover and simmer 50 to 60 minutes or until the wheat berries are tender, but still firm. Drain. Step 2: Toss wheat berries and remaining ingredients. Cover and refrigerate at least 1 hour before serving. Now that’s a healthy dose of vegetables and protein! Yummy little veggies. Photo by Kate Langenburg. As of late, I have been getting into making a lot of cold mediterranean salads. I must admit, I like the feta cheese! But every time I open a new container of feta cheese, there lurks another wonderful recipe on the back of the lid. Last week, I decided to make a special kind of green bean salad from the back of one of my feta cheese lids, so I went down to the local farmer’s market and picked up a few pounds of the locally grown veggie. Step 2: Toss beans with dressing, cheese, onions, and dill in a large bowl. After making this great concoction, I fed it to my room mate, family members, and I ate a whole bunch, too. This recipe is easy, and a must have for anyone who likes dolled up green beans. Mine is the anti-tomato version. It's still delicious! Photo by Kate Langenburg. As some of you may know, family gatherings are a great opportunity to bring different kinds of foods for everyone to enjoy. Well, as luck would have it, I recently had one of those kinds of family gatherings, at which I tasted the best pasta salad I’ve ever had. I would like to introduce you to Mediterranean Pasta Salad, courtesy of Norma. In a span of about two hours, the huge bowl she had made completely disappeared, and the reserve stock in the fridge was eaten later that night! The greatest thing about this dish is its versatility. As Norma herself said it, she never follows a recipe and she always puts her spin on it. That, my food loving friends, is highly recommended with this pasta salad. You can throw in new veggies, take out what you don’t want, or even include some other form of dressing other than the oil and vinegar suggested. Step 1: Combine all ingredients in a large bowl. Toss gently until well mixed. Step 2: Refrigerate several hours before serving. That’s it! If I were you, I’d double the recipe. It makes a smaller amount, so if you like to keep eating leftover pasta salad all week like me, doubling is the way to go. This stuff goes great with a sandwich and transports easily for lunches on the go! Does this Southwest Black Bean Salad look great? Photo by Kate Langenburg. Scanning my cookbooks for something tasty I could make in abundance and take for lunch, I came across a recipe for this Southwest Black Bean Salad. It comes from the Weight Watchers New Complete Cookbook and boy, is it zesty and delicious. It calls for one jalapeno pepper. I used one that I grew in my container garden. (Apartments leave little space for real gardens.) It was definitely zippy, but if you are a real fan of spicy things, I would recommend using two jalapenos. That way, you’ll get a little more bang in your salad. Step 1: In a large mixing bowl, combine all the ingredients, then toss. Let stand, covered, until the flavors are blended, at least 1 hour. Step 2: There is no step 2. It’s that easy! This recipe would go great at a bbq or similar function. You’ll have all the guests on your invite list asking you for more when it disappears! In that case, of course, you might want to double the ingredients.